Tongue scraping is a quick and easy habit that improves your oral ecology and your well-being. 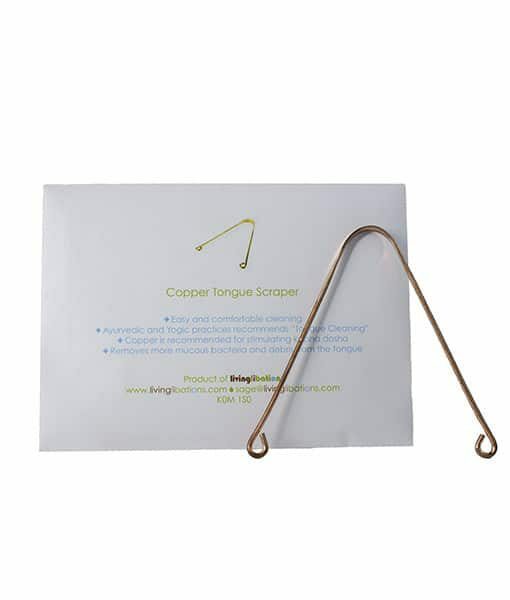 Our Copper Tongue Scraper is a magic mouth wand ready to transform your tongue into a toxin-free bed of awakened taste buds! Tongue scraping eliminates bad breath, prevents cavities, improves internal organ function, and aids digestion. Adding this practice to your daily oral care regimen is a simple, powerful way to improve your sense of taste, monitor your internal health, and remove periodontal plaque. Embrace the day and take a stand. By scraping away the gobblety-goop! This Copper Tongue Scraper is your taste buds’ best friend! It removes the foul-smelling film that collects on the tongue and promotes bad breath. It also enhances taste bud performance and sensitivity. Once freed to function optimally, each taste bud can receive strong flavor signals from food, and this may lower the need for added salt and sugar for flavor. In Ayurvedic tradition, heightened taste bud sensitivity also supports weight loss; when the tongue experiences every delicious flavor, every bite is savored and quality of food is appreciated over quantity. Tongue scraping may also improve immune function. Ayurvedic tradition teaches that each area of the tongue corresponds to an internal organ. By scraping the entire tongue, each of these organs is awakened and revitalized, leading to a myriad of body benefits including better digestion and better bowel movements. Check tongue for changes. Before scraping, examine your tongue in the mirror. Note the color of your tongue and the texture of any film or buildup. Look at your tongue every time you scrape so you can closely monitor its health. Scrape back to front. The majority of bacteria that collect on the tongue hang out near the back where it is dark and warm. Gently glide across the surface of the tongue, scraping from the back to the front. Rinse between each scrape. Rinse the scraper with warm water to remove the residue that has collected on the scraper. Repeat 7 to 10 times. You may find that quick strokes of the scraper are more effective at removing buildup than one long scrape. I used to scrape my tongue with the back of my plastic toothbrush, but switching to a bamboo toothbrush had me wondering how I could get the same effect in a less-waste way. 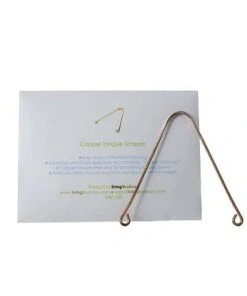 Enter the Copper Tongue Scraper, a miraculous invention I’m so blessed to be using right now. It removes all the gunk from my tongue, leaving such a pleasant sensation in the mouth. 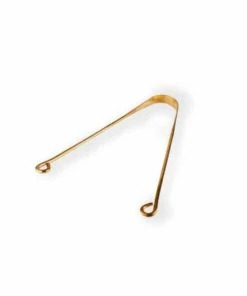 Even my hubby is now addicted to using the tongue scraper twice a day. If you don’t own one yet, what are you waiting for? !